Fruits, welcome vegetables! 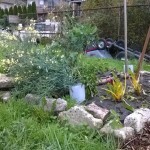 Garden beds are nearly finished and they are lively. 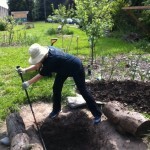 The soil in all of the garden beds is recycled from the soil taken out to make the path. We outlined where garden beds would go and the excavators dumped soil in those spaces. This tactic saved labor but there was still a lot of soil moving and leveling needed. 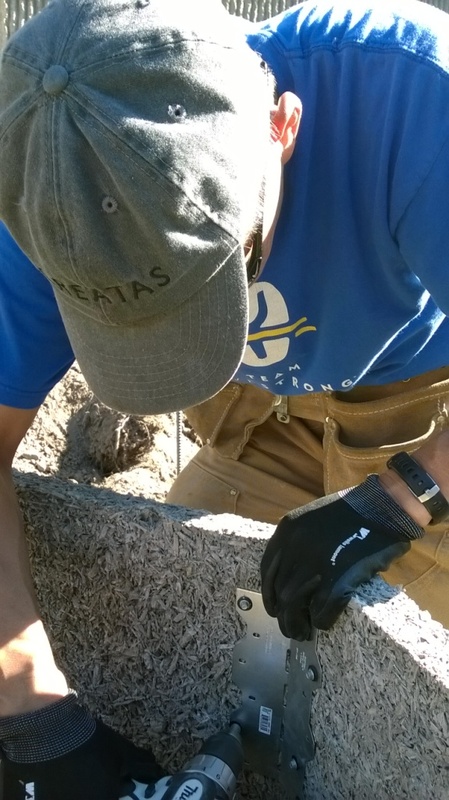 We started by collecting rubble from nearby construction sites. Torn up driveways are best because the pieces of urbanite are fairly thin. 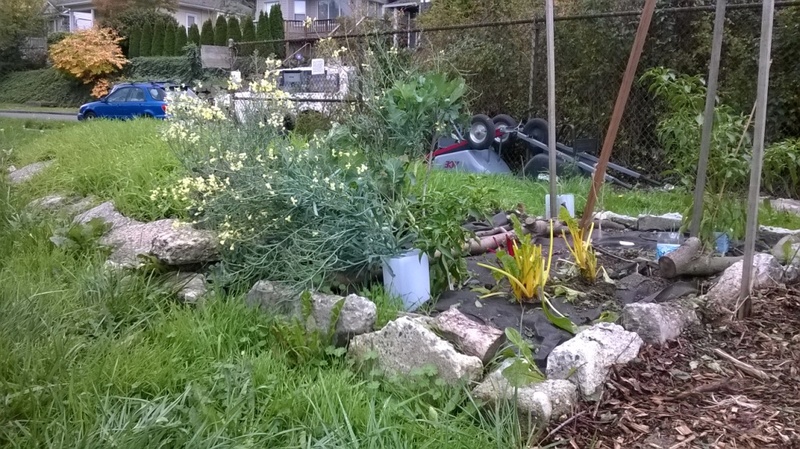 The first bed was a mound bed: piled up dirt and then bordered with rubble. 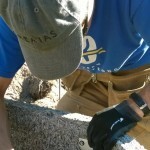 The mound method costs nothing and takes the least amount of labor. The blueberry mounds do not even have a border. You can see we went a bit overboard with the vetch/rye grass cover crop. In the spring, we will try the no-till method of bed preparation: cut the overwintered plants at ground level just as they start to bloom but before they go to seed. Next came Liz’s herb spiral. 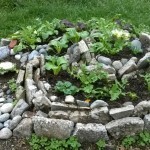 The spiral has a second objective in addition to providing tasty mustard greens. 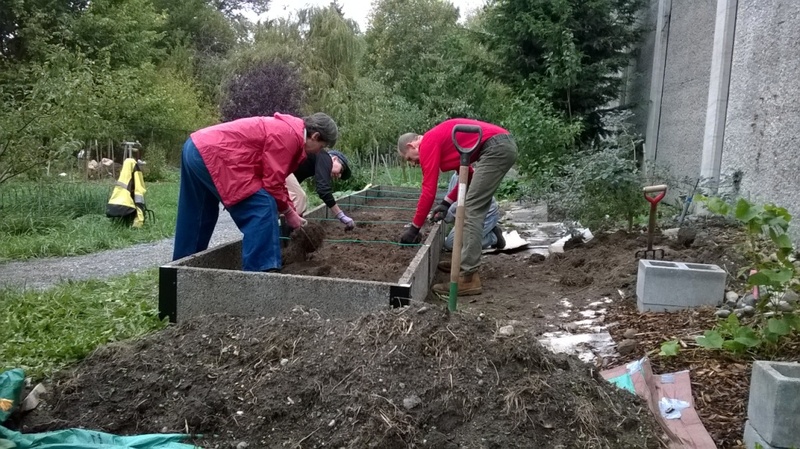 Volunteers dug down below the ubiquitous hard subsoil layer, in an attempt to improve drainage. Logs were dropped into the big hole before we backfilled. 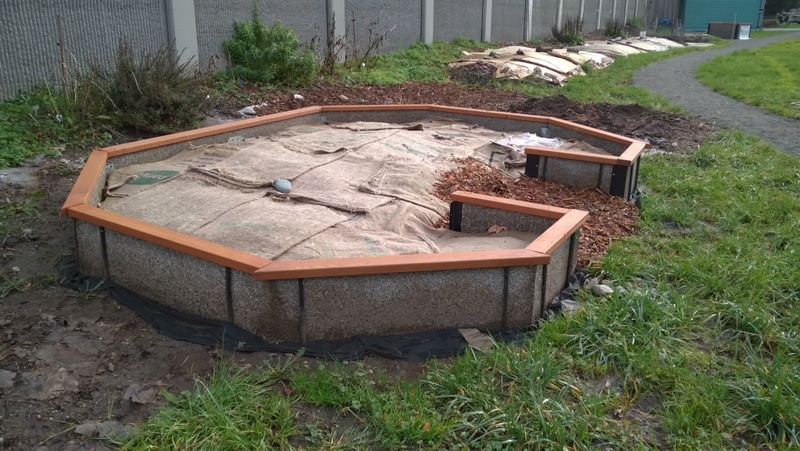 Time will tell whether this tactic will reduce the amount of standing water in that area during the winter months. Then came the fancy beds; the Faswall-framed beds. 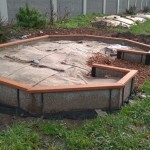 The Faswall material is used to make homes but also can be fashioned into garden bed panels. Recycled wood is ground up, concrete is added and then the material is mineralized. There are no resins. These panels cost less than cedar. The only problem was, someone requested an Octagon. Due to the angles, this bed took four times as many hours to construct! Still, it’s rather unique. 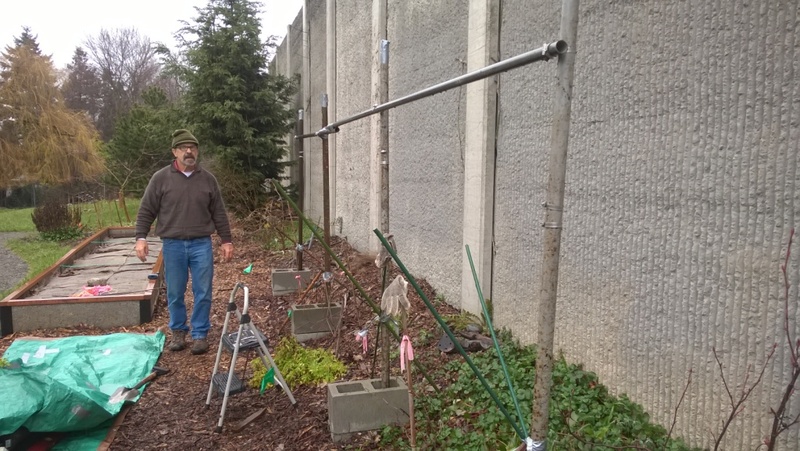 More recently, we are working on grape trellises. 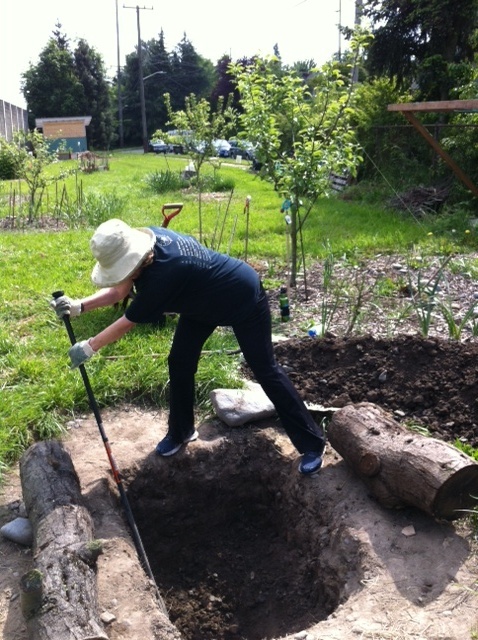 A volunteer offered up old steel pipe from her yard. We had to cut 11 pieces with a pipe cutter. The job is quiet and rather meditative … round and round and, well, finally the end pops off. Some of the pipe was so rusty that the pipe cutter slid around a bit. We had to buy hose clamps, Quikrete, wire and turnbuckles. These material costs were minimal. We applied for and earned a compost donation from Cedar Grove and only had to pay for delivery. 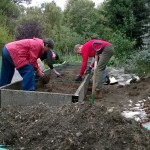 Gardeners are deliberating how much to add to the garden beds. The new gardeners are encouraged to experiment and document so we can determine what, if any, soil amending is needed. One of our goals is to minimize inputs and outputs. There is still one garden bed open! Remember, you can co-garden with a more experienced gardener if you don’t have much experience. 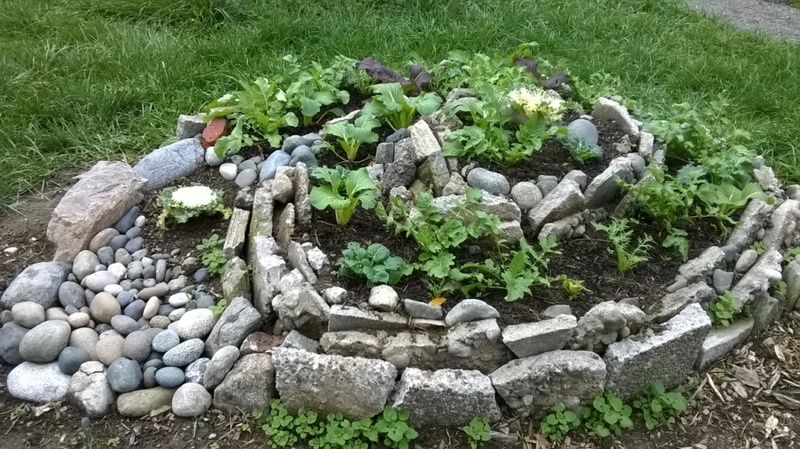 This entry was posted in Construction, Plants, Uncategorized and tagged garden bed, herb spiral, Trellis on January 21, 2016 by Ruth. We are pleased to unveil two new art pieces in the orchard, both recently installed and both splendid. 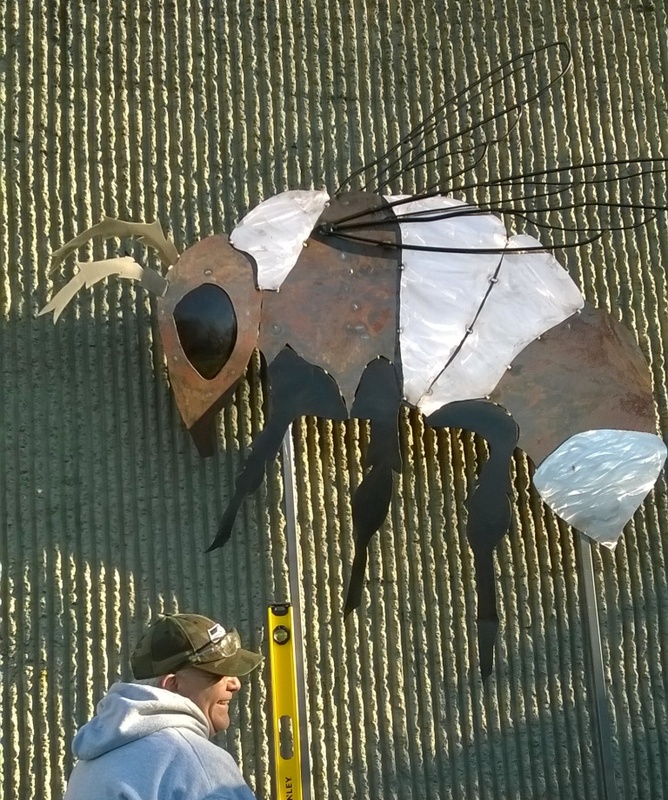 Chris Lemmen of Steel Bamboo is the creator of the floating bumble bee (bombus mixtus). The bee is made of metal. Landscape art is a specialty for Chris. The bee is headed north toward the pollinator pathway! 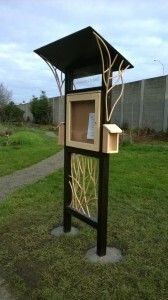 Peter Goetzinger, creator of many public art works, designed the entryway kiosk. It’s very functional, with a signboard and two brochure holders. Those who pass by can now readily find orchard brochures and self-guided tour handouts. Jennifer K, Michelle P, Ken Y, Sue H, Nancy H, Nancy M, Jackie C, Liz A, Nora L and Stuart S.
This entry was posted in Construction, Uncategorized and tagged art, bumble bee on January 1, 2016 by Ruth.